Fall Color: It’s not just for leaves anymore! As we approach fall and its wide range of colors, we sometimes forget about other sources of color in the landscape: FRUIT! Viburnums, Deciduous Hollies, even Dogwoods can provide fall color in the landscape. 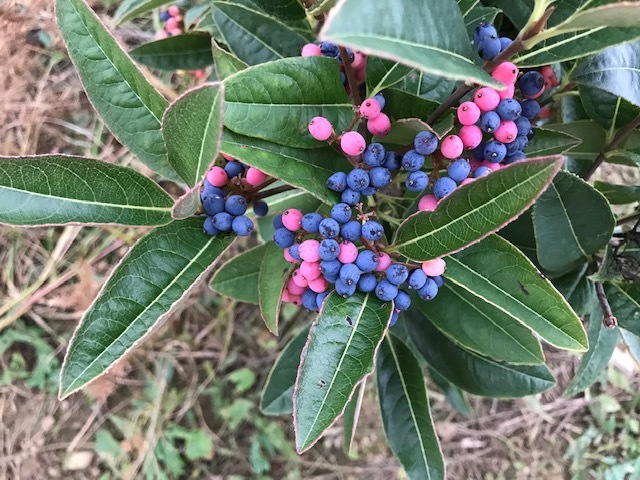 Viburnum fruit can range from almost black to purple (Viburnum dentatum). and yellow (Viburnum dilitatum 'Michael Dodge). In addition, these fruits can attract wildlife to the landscape. to orange and yellow (Ilex verticilatta 'Winter Gold'). The fruit will remain after the leaves fall and until eaten by birds and wildlife. Beautyberry can provide a splash of violet-purple color (Callicarpa dichotoma 'Issai'). So as you plan for next year and what plants to consider, don’t think just about flowers or fall color. Consider the fruit.